In the weeks prior to the Philae landing, the Rosetta spacecraft maintained an orbit around Comet 67P/CG at less than six miles from its surface. The ESA has just released a collection of previously unpublished images taken by Rosetta's navigation camera, revealing the varied and dramatic terrain of a mysterious world. 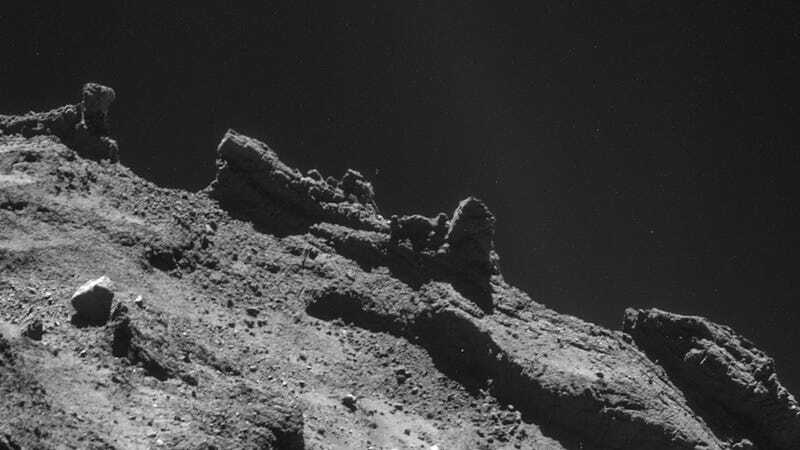 Boulders seem to defy gravity in the view below, apparently clinging to the steep sides of the larger lobe of the comet — although, of course, it is all a matter of the orientation of the image and the local gravity vector. But perhaps the most intriguing feature in this frame is on the right-hand side, where thin layers of rock have the appearance of being flexed or compressed. This feature sits close to the "neck" of the comet, which can be seen in the background rising up towards the smaller of the comet's two "lobes." One theory for the comet's formation is that two smaller bodies collided to create the comet shape we see today. Whether this layered feature is due to such a scenario or a completely different process remains to be seen. This scene features the boulder named Cheops, the largest and brightest boulder towards the top left of the image. It measures about 147 feet across and 82 feet high. Cheops and the surrounding cluster of boulders reminded scientists of the famous pyramids at Giza near Cairo in Egypt, and so it was named for the largest of those pyramids, the Great Pyramid, which was built as a tomb for the pharaoh Cheops around 2550 BC. This view focuses on the boulder-strewn neck region of the comet, with the smaller lobe on the left and the larger lobe on the right. The scene also shows the contrast between the rugged material in the cliff walls rising up to the smaller lobe and the soft, more "textured" material that characterizes the neck and that is also coating the larger lobe in this region. This dramatic view along the horizon highlights several relatively smooth, flat-topped plateaus that stand above the rugged surface on the larger lobe of the comet. But their flat tops betray the scars of the walls just below, extensively crisscrossed with fracture-like features. At their bases lies plentiful rubble, perhaps once originating from the cliff faces, having crumbled away under the erosive forces at work on the comet.